If you have, then it’s possible you may have been placed at a low risk of infection due to apparent poor hygiene standards. If you’re concerned, please call: 03330 142479 or visit www.england.nhs.uk for advice. 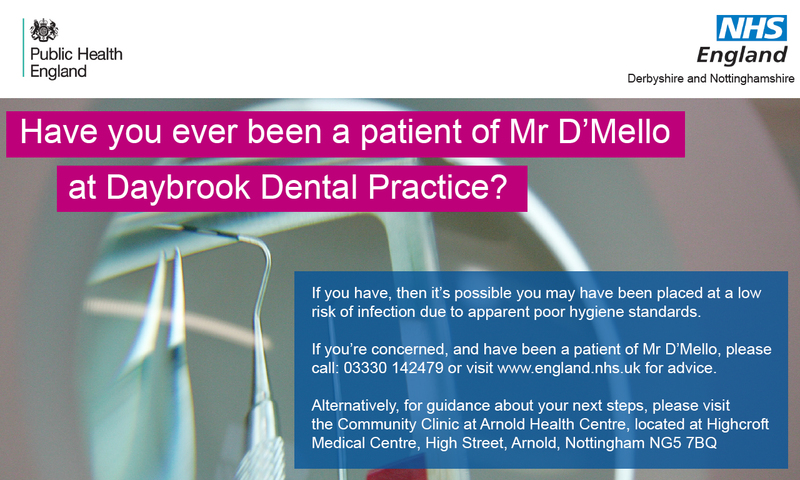 NHS England in Nottinghamshire has been working with Public Health England to investigate apparent breaches of infection control procedures by Mr D’Mello, who was contracted to provide NHS dental services at the former Daybrook Dental Practice. The investigation team has also consulted with clinical experts in Public Health England, who undertook a clinical analysis of the potential risk to patients. Mr D’Mello has recently been tested by our Occupational Health Team and found to be clear of blood borne viruses. 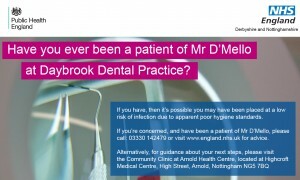 NHS England can therefore confirm that there is no risk of infection from Mr D’Mello himself. However, Public Health England did identify that patients seen by Mr D’Mello appear to have been placed at a possible low risk of infection from blood borne viruses (hepatitis B, hepatitis C and HIV), due to apparent multiple failures in cross-infection control standards whilst undergoing dental treatment.